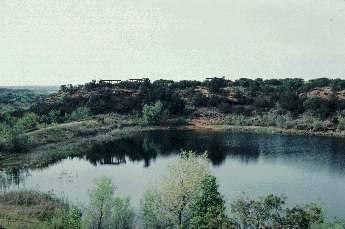 The park is located in Texas, between Quanah and Crowell off of Texas State Highway 6.
societies based on the business of tending them. The majority of the front section of the museum is dedicated to the Native American Herdsman. 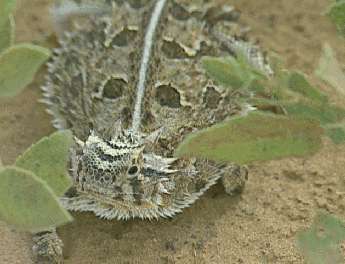 Cynthia Ann by Texas Ranger Sul Ross in 1860.
herdsman in a uniquely manual labor of love. The museum then moves the visitor past the dominance of the American Indian to the emergence of the American rancher - an occupation that elevated the herdsman lifestyle from its semi-nomadic beginnings to its new place at the center of a major agribusiness. Large photographic collages and panoramic images, some by the noted Texas livestock reporter Frank Reeves, show cattle drives, brandings, chuckwagons, auctions and other similar cowboy era themes. An authentic chuckwagon, donated to the CBSP museum by the prominent O'Neal family, provides a central focus for the glass cases that present ranchlife artifacts, ranging from household ceramics and an early sewing machine to weapons, leather chaps and furniture. see present-day use only on the ranch, reveal themselves to be prized for their durability and practicality. The artifacts of the Campsey Collection are on extended loan to the Copper Breaks museum through the generous contribution of Quanah businessman Larry Campsey. 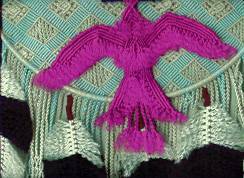 Marcia Haynes, Margie Streit, Joe Urquizo; macrame by Stephen Harmon, beadwork, sandpaintings, photographs, prints and more by a number of artists. The Third Annual Summer Art Exhibition, scheduled for June 1999, willshowcase works by local artists. 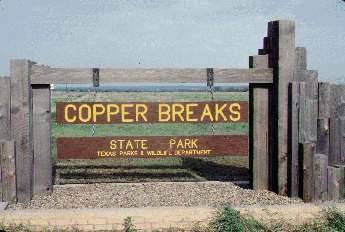 draw visitors to Copper Breaks and enhance their outdoor experience. 839-4331 weekdays during business hours. Visit the Summer Arts Exhibition coming July 24, and ending August 22, 1999!! With a crafts demonstation/show July24,1999. Magazine Description Discovering Archaeology is a bimonthly magazine reporting on the latest discoveries in archaeology and archaeological science. Through informative articles, vivid graphics, and beautiful photographs, readers will take part in the latest discoveries from around the globe  both on land and underwater. The magazine is an authoritative source for the latest breaking news in the archaeology. Magazine Description American Heritage uses the lens of history to provide a unique perspective on art, literature, politics, travel, and the changing lifestyles of Americans. Magazine Description Expertly researched articles, galleries of period photos and full-color reproductions of paintings, posters, banners, flags, and artifacts can all be found in the pages of American History. The magazine also offers book news, reviews, history updates, and information about museum exhibitions.